If you’ve been to Smorgasburg you know Mighty Quinn’s. It’s the one with the huge smoker and – invariably – the longest line. So when we got to the fair super early we had to take advantage of its relatively short line. 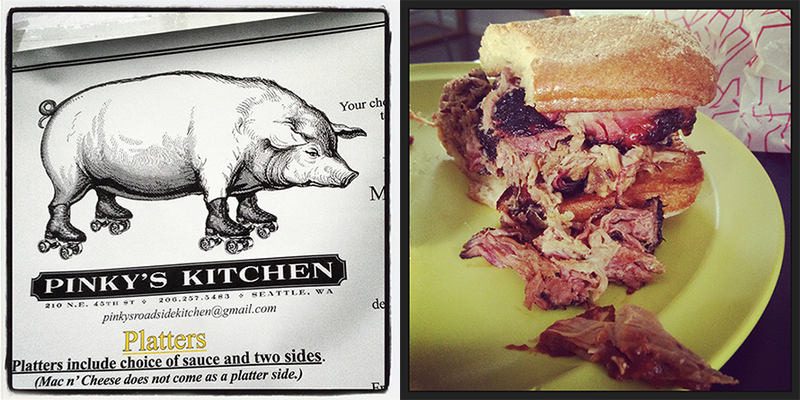 Sure, it meant a brisket sandwich for breakfast but, wow, what a brisket sandwich! 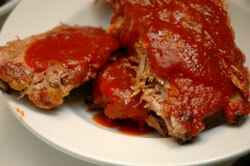 Tender, flavorful, meaty with a sauce that has the perfect balance of tang and smoke. It’s a cross between vinegar and tomato based owning influence to no one particular region. No wonder its such a favorite. The chefs take a lot of pride in their food (and look at those forearms!) and are happy to chat BBQ with their eager customers. Next time I’ll even brave the longer lines to try their lamb which is only available later in the day. It’s sure to be worth the wait. A dancing, happy animatronic pig and the aroma of Korean spices and cooking meat greets you at the adorably named Los Angeles Koreatown BBQ spot, Honey Pig. The spacious room is perfect for groups and they’re kid friendly (Van came out of there spotted head to toe with sticky rice). 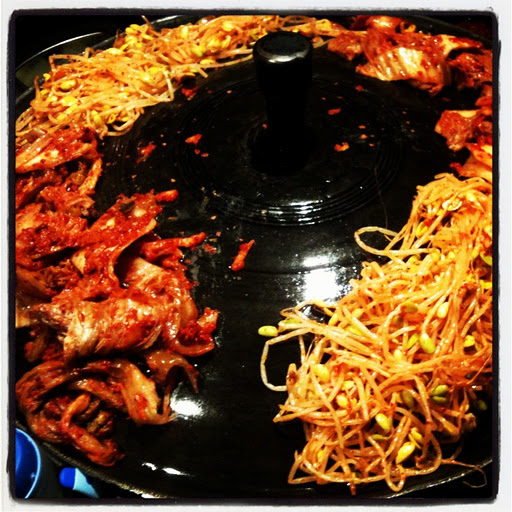 The domed cooker doesn’t over do the meats and a friendly staff comes by to help with cooking so you can concentrate on chatting with friends under the influence of huge bottles or beer and soju. A simple but delicious scallion salad starts things off brilliantly. Definitely a dish I should try at home. Thin strips of marinated beef and pork belly were excellent and the condiments amazing. Loved the bean paste and salt and pepper oil. It was my first time having kimchee hot temperature wise (though the spicy kick here is no joke too) and it was yummy. Be sure to opt for the fried rice towards the end, where a server will mix all the left overs with rice and veggies. So good. Airy, friendly and nestled in a cute triangle in Fort Greene, The Smoke Joint is an appealing spot to enjoy smoked meats and that’s exactly what I was craving last weekend when we stumbled upon the place. We shared the plate of pulled pork and a half rack of baby back ribs. 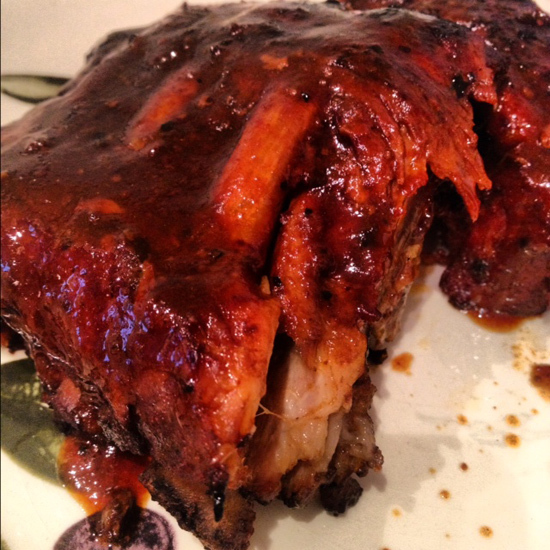 Both were tasty, the ribs perhaps winning out for flavor, but extra kick, flavor and moistness can be added with the sweet or spicy sauces that come to the table. The sides: a creamy, bring-to-a-picnic-worthy potato salad and a cakey, sweet cornbread were perfect companions as well as the refreshing “Tiger Woods” – an Arnold Palmer for a new generation. In that area near BAM, where it might be hard to find a spot before or after a show, I highly recommend Smoke Joint. Adjacent there is also the Pig Bar, a bourbon lover’s paradise that I’d like to visit once I can throw one back again. Ben Grossman and Craig Samuel serve what they call “real New York barbecue” so BBQ snobs can’t make too many crying comparisons. I’m not sure where they land for me in the grand scheme of local BBQ because I don’t always order the same thing, but my guess is someplace in the high middle. Hill Country is, and I say this with all my heart and kindly, just a fat assed restaurant. Everything (with the exception of the cheery waitresses) is big and loud: two warehouse sized stories holding huge communal style picnic tables, a seemingly 15 foot TV (blaring sports), a band upstairs shouting countrified 80's tunes (they were actually quite fun), drinks with vodka, tequila, and everything else (mine, the 8 layer dip, also had jalapenos and was rimmed with BBQ rub salt) and portions of meat like you have never seen. I really did feel like I was back in Austin for an evening (I would have even more so if some of it were outside and the diners were more rockabilly than NYU), which was fun. But all this would mean nothing if the food's not great and I have to say, it's the best I've had in the city. 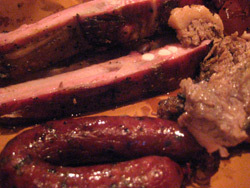 The jalapeno sausage and moist brisket were phenomenal! Sides also delivered with the cornbread and chipotle deviled eggs standing out to me (my friends all raved about the slaw too, though I am never a fan, so I'll have to take their word). The ordering process can seem confusing. You have a meal ticket that you bring to the meat counter where you tell butchers how big a portion you want. 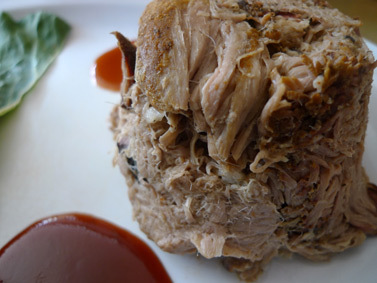 I recommend no more than one pork rib, while nice and meaty, they were the least impressive meat dish we had, lacking in flavorful flair, but better slathered in the sauce provided at the tables. You will feel your indulgences soon after dining and find yourself longing for big bowls of salad for days, but it's worth it – particularly the sausage and brisket. R.U.B. stands for Righteous Urban Barbeque. And it deserves the name. We went with a large group and everyone enjoyed their meals, from bbq chicken sandwich with “sloppy toppies” (in this instance meaning coleslaw) to bbq half duck. Most of us opted for ribs and as you can see from Mike and Astrid's before and after shot, our plates were licked clean.